In the award-winning 2000i Cinema Pack, our designers transcended their previous achievements. Its precision soundstage, powerful dynamics and rich deep bass make it the natural choice for both home cinema enthusiasts and discerning music lovers. Critically acclaimed by industry experts including What Hi-Fi?, AV Forums, Home Cinema Choice and many more, this cinema pack provides sensational sound at an excellent price point. Each of the products incorporates class leading technology; Q Acoustics ensure the ultimate cinematic and musical experience in your chosen room. 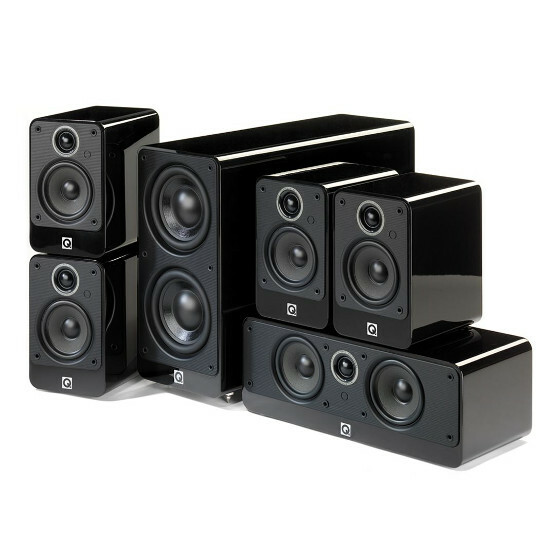 The 2000i Cinema pack comprises 2 x pairs of 2010i, a 2000Ci Centre Channel Speaker and a 2070Si Subwoofer. With various finish and display options, the Q Acoustics 2000i Series 5.1 Cinema pack provides optimal flexibility & integration options for your home. Available in Graphite, Walnut, Gloss Black and Gloss White, the 2000i Cinema pack speakers can be stand or wall mounted, using the dedicated 2000ST stand and 3000WB wall brackets or Q Acoustics elegant 'floating' glass shelves. The subwoofer comes with carpet spikes with optional rubber caps for an equally solid stance on wooden or tiled floors.